SSC result 2017-18: The Staff Selection Commission (SSC) has postponed the result for stenographer grade C, D exams. The SSC was earlier scheduled to share the result on December 28, 2018. The SSC has decided to review the SSC Steno 2017 Skill Test scores and commission is likely to share the result in January 2019. 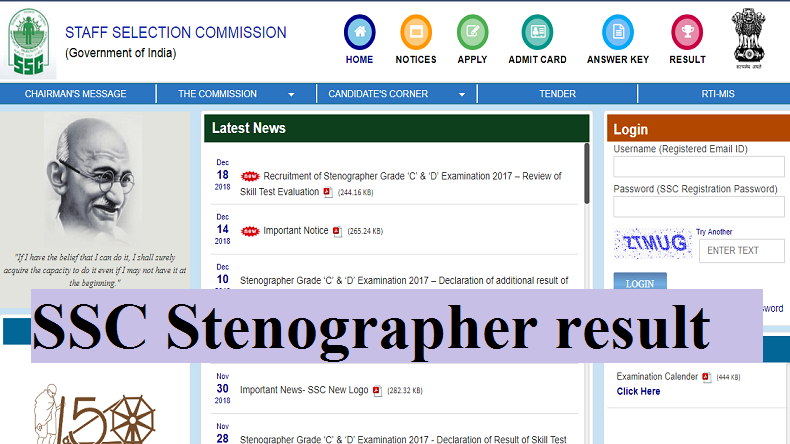 The Staff Selection Commission (SSC) has postponed the result for Stenographer grade C, D exam result 2017, which was scheduled to be released on December 28, 2018. The SSC has delayed the result due to the representations received by the candidates concerning the evaluation of Skill test. According to the reports, the SSC has taken the decision to postpone the result in view to newly received representations and has decided to review the SSC Steno 2017 Skill Test scores. Since this process may take time, the final result will not be announced.” Earlier, on November 28, 2018, the SSC had shared the list of successful candidates who managed to qualify the SSC Steno 2017 Skill Test, while the second list of qualified candidates was released on December 10, 2018. The Staff Selection Commission (SSC) has not shared the new date for the announcement of the results and likely to publish the stenographer grade C, D exam results in January, say reports.